When’s the last time you bought a watermelon in the winter? I know I can’t answer that question, but I’ll tell you what: ever since summer hit, it’s been a regular part of my diet. There are some foods that just taste better in the summer. And whether it has to do with availability or just a familiar hot weather flavor, there are a number of foods that are simply more abundant in the summer months. More importantly, some of these summertime foods can actually help you out in the mood department. Although depression and poor mood can be more common during the winter months, they can still creep up on you in the summer. There are various things that can get a person down in the summer. With all of the parties, events, and travel plans, it can be expensive or for some it can be a very lonely time. You might not be able to deal with the heat or maybe you feel depressed that you’re not capable of being as active as you once were. Perhaps you miss a loved one who is no longer with you, or find yourself down for a host of other reasons. Whatever the reasons are, you don’t have to let summer get you down. Let’s look at three summertime foods in particular that can help improve your mood—and overall health. I want you to consider including these options in your diet if you find yourself feeling a little down during the long summer days. 1. A great food for mood is watermelon. It’s very high in lycopene, an antioxidant that helps with blood flow and protects your brain tissue. Protecting brain tissue is important to keep your brain happy and healthy and regulate your moods. Lycopene can also help reduce the inflammation commonly associated with dementia and depression. In addition to all the mood-related benefits, it has also been shown to prevent certain cancers. Plus, watermelon tastes great! There is actually more lycopene in watermelon than in the much-touted tomatoes. 2. Salads are a great source of summer nutrition, with romaine lettuce being a particularly great basis for any salad. You can add all kinds of fruits, vegetables, seeds and protein to your romaine to make a nice light meal to combat the heavy humidity that blankets so much of the country. Romaine is a great source of vitamin-B and folate. Low blood levels of folate have been linked to depression and mood problems, because the nutrient is thought to impact the ability of neurotransmitters to communicate with each other effectively. 3. Another summertime BBQ classic is corn on the cob, which is a healthy carb that can boost serotonin levels. 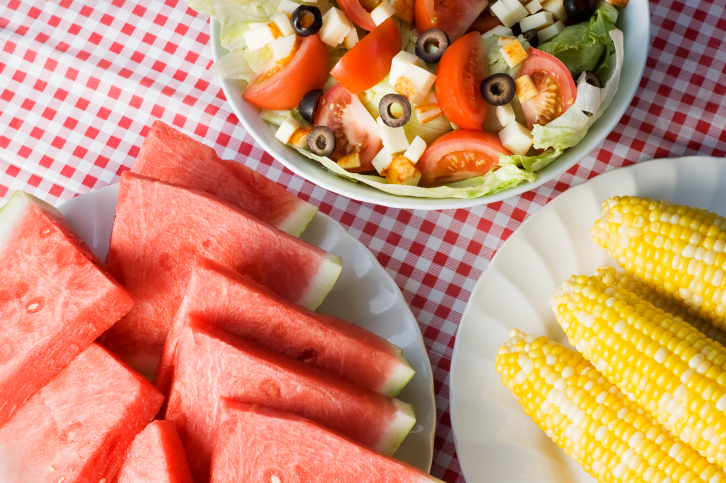 Serotonin is the hormone that improves mood, so eating healthy fruits and vegetables like corn can help make you feel better if you’re a little down on a nice summer day. Nutrition plays a big role in how you feel both physically and mentally, and the summer months offer an exclusive opportunity to eat some great foods that have the benefit of boosting your mood! It’s the best time of the year, so get outside, eat healthy, and enjoy the short season! Young, S., “Folate and depression—a neglected problem,” Journal of Psychiatry and Neuroscience, March 2007; http://www.ncbi.nlm.nih.gov/pmc/articles/PMC1810582/. Niu, K., “A tomato-rich diet is related to depressive symptoms among an elderly population aged 70 years and over: a population-based, cross-sectional analysis,” Journal of Affective Disorders, January 10, 2013; http://www.ncbi.nlm.nih.gov/pubmed/22840609.